Did Rats score the greatest derby goal of them all? Evertonians up and down the country will all have their favourite derby goal, ranging from Sharpy’s cracker at Anfield in 1984, Sheedy with his two finger salute to the Kop in 1987 to Andy King scoring at Goodison to end the Blues’ derby hoodoo in 1978. However I would like to put forward a goal by Kevin Ratcliffe, a 25 yard grubber, which spat and bobbled under a despairing Grobbelaar and into the Kop end goal to seal a famous 2-0 away win for the Toffees, as the greatest goal of them all. For those too young to remember this goal it is certainly worth a watch. Everton and Liverpool were the top dogs in English Football, with the Blues the defending Champions. Everton arrived at Anfield in confident mood and had a decent lead at the top of the Division One table. 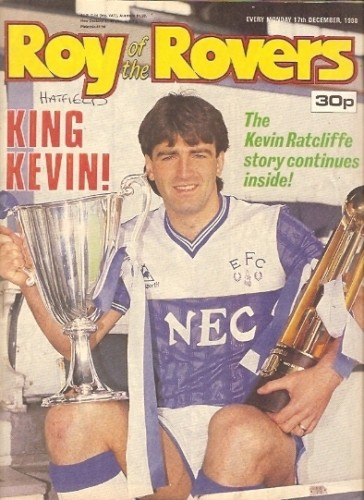 Kevin Ratcliffe was hardly a prolific goalscorer. In fact, he only scored twice in his entire Everton career, the other having come 3 years earlier in a 1-0 win away at Carrow Road, home of Norwich City. The game at Anfield was a fantastic match, end to end football with Lineker and Rush causing the two defences all types of trouble. However, entering the final 20 minutes the game remained delicately poised at 0-0, with both teams pushing for the vital first goal. A ball from Lineker into the corner, appeared to be too much for Peter Reid, but the scampering midfielder made his ground and collected the ball by the corner flag. Exhausted by his lung busting run, Reid laid the ball back down the line to Richardson, who calmly passed inside to Alan Harper, on as a half time substitute for Paul Bracewell. As Harper played the ball into space in the middle of the pitch, it was Ratcliffe pushing forward from his central defensive birth who picked the ball up, one touch later he unleashed a shot towards the Liverpool goal. The shot appeared to lack the power or accuracy to defeat Grobbelaar, but the ball skipped off the turf and much to the keepers despair and to the delight of the Evertonians the ball trickled through the keepers legs and into the empty net. Cue delirium from the travelling Toffees, few on the terraces could scarcely believe what they had seen, but all in Blue took great delight in an incredible moment. Everton went onto to score a second goal 5 minutes later, Gary Lineker scoring to ensure the three points traveled back to Goodison. Unfortunately, the win wasn’t enough to take the title. Everton failed to build on the victory, and a 1-0 defeat to Oxford in late April, handed the title to our Merseyside rivals, although the Blues would hit back to win the Championship a year later. A truly fantastic goal and for me, the greatest derby goal of them all.